Surface Pro 2 is the second generation of Microsoft’s highly capable Windows tablets that can comfortably replace your laptop. Like the first gen Surface Pro, Microsoft Surface Pro 2 runs full Windows OS running normal Windows desktop software including full MS Office suite and Metro style apps from Windows store. Surface Pro 2 comes with the new Windows 8.1 OS, faster and more powerful processor and 75% longer battery life. Microsoft Surface Pro 2 runs the new and refined Windows 8.1 on a more efficient and faster fourth generation Intel Core i5 processor (Haswell). These delivers great performance while still offering 75% more battery time. Surface Pro 2 will be mostly available with 64GB and 128GB models offering 4GB RAM, but 256GB and 512GB models offering 8GB RAM will also be available. They all come with 200GB free SkyDrive storage for 2 years. Microsoft Surface Pro 2 still features a 10.6-inch display with full 1080p HD resolution with the back and front camera now improved to 5 megapixels and 3.5 megapixels respectively. Both cameras can shoot full 1080p HD video and offer better low light performance. The kickstand on the back now opens to two positions, one better suited for standing the tablet on flat surfaces like on a table, while the other makes it easier to stand the Surface Pro 2 on your lap. 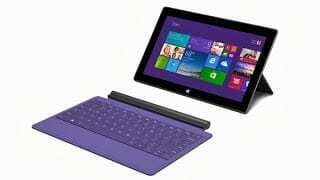 Microsoft has also redesigned the innovative keyboard covers that turns the Surface Pro 2 to a laptop replacement. The Touch Cover and Type Cover accessories (keyboard covers) are now much thinner, lighter, faster, and are backlit for typing in low light or in the dark. Microsoft added 10 times more sensors to the Touch Cover for more accurate keystrokes and for gesture support. 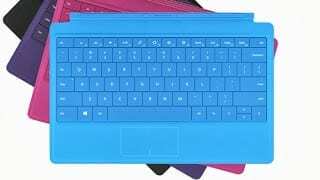 Microsoft is also offering a new Type Cover with built-in battery (called Power Cover) that will extend the battery time of the Surface Pro 2 by up to 50%. There is also a wireless adapter that connect to either the Touch or Type Cover to enable you use them as a remote wireless keyboard using Bluetooth 3.0. Microsoft will also be offering a Docking station for the Surface Pro 2 that will among other things enable you connect the Pro 2 tablet to desktop peripherals. With the docking station, the Surface Pro 2 can connect to a larger external monitor. You can also connect speakers, ethernet, and power supply via the docking station with 1 USB 3.0 port and 3 USB 2.0 ports for more peripherals. 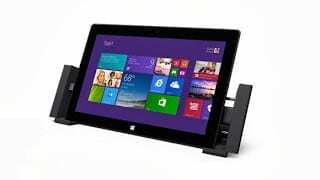 Microsoft Surface Pro 2 comes with microHDMI port, full USB 3.0 port, Wi-Fi 802.11 and boasts of up to 10 hours battery life. It also features a Pro Pen for taking notes and marking-up on the Pro 2. The tablet supports palm blocking, making the process more comfortable. Microsoft Surface Pro 2 also comes with free Skype calling to landlines in more than 60 countries for one year and unlimited Skype Wi-Fi in more than 2 million Wi-Fi hotspots worldwide. Microsoft Surface Pro 2 is now available at a few online stores in Nigeria. Prices starts at 220,200 Naira. The Touch cover 2, Type cover 2, Power Cover 2, Wireless adapter, and Docking station are sold separately for $119.99, $129.99, $199.99, $59.99, and $199.99 respectively.